As pretty much everyone in the horror community knows by now, we lost one of the greats over the weekend. 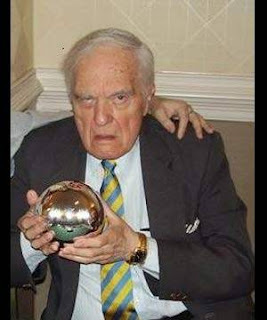 Angus Scrimm, known first and foremost as Phantasm's The Tall Man, passed away at the age of 89. The Phantasm series has been one of my favorites ever since I was a teenager due in no small part to Scrimm's ability to restrain his performance while still managing to dominate every scene he's in. I'm not one to want to meet many of my horror idols, but Scrimm is one of the few who I regret never trying to meet at a convention or other event. From all accounts Scrimm was the exact opposite of his Tall Man character: warm, talkative, and very approachable. Watching interviews and behind the scenes footage with Scrimm shows a man who loved what he got to do for a living and made sure it was an enjoyable experience for those around him. Angus Scrimm was born Laurence Rory Guy on August 19, 1926 in Kansas City, Missouri. He studied film at the University of Southern California, but work was difficult to find for him at first, so he found other jobs to make ends meet. These included doing book reviews for the local newspaper and writing copy for TV Guide. One such job actually won Scrimm a Grammy. He was hired by Capitol Records to write liner notes in albums for artists including Frank Sinatra and The Beatles, and in 1974 he was given a Grammy for his liner notes for "Korngold: The Classic Erich Wolfgang Korngold." Eventually he started getting work, and in the mid 1970s he had his first collaboration with Don Coscarelli when he was cast as an alcoholic father in Jim, the World's Greatest. Coscarelli claims to have received his first taste of the "evil eyebrow" during production, as the inexperienced director would have Scrimm wait in a room for 8-9 hours only to tell him that he would yet be needed to film any scenes that day. The collaboration went well enough, however, that Coscarelli cast Scrimm in what would become his iconic role. And Tall Man was not just a name. At 6'4", Scrimm really did cast an imposing figure, and to exaggerate that he wore suits that were too small and lifts in his shoes. 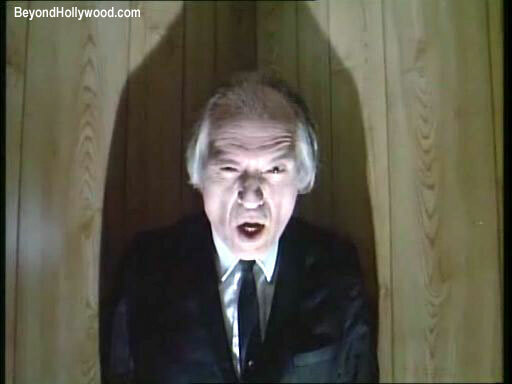 For anyone wondering what the hell was up with Scrimm's hair in the final scene in Phantasm, it's not just an optical illusion that makes it seem shorter. After principal photography wrapped, Coscarelli decided he wanted to change the ending. Unfortunately Scrimm, thinking he was finished, had recently gotten a haircut. They decided to film the new ending anyway, figuring that no one would notice or care. According to IMDb, Scrimm has 51 film and television roles to his credit, including a recurring role in Alias. As it turns out, J.J. Abrams is also a fan of Phantasm. In his later career, he felt uncomfortable as an LA-based actor taking roles offered to him in New York, not because of concerns over travel but rather because he felt bad taking work from New York actors. One final tidbit to show how Scrimm took care not to take himself too seriously. Proving that he was apparently game for anything, he did a series of TV spots for an Aqua Teen Hunger Force Halloween marathon on Adult Swim. Call me crazy, but I even get chills when he says "BOY!" in this goofy context. King, Susan. 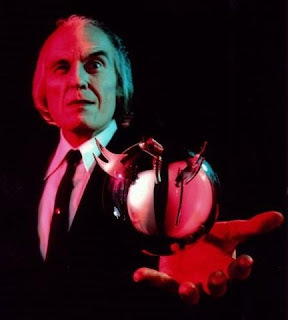 "Angus Scrimm, 'Phantasm's' Tall Man, still a striking presence." Hero Complex. 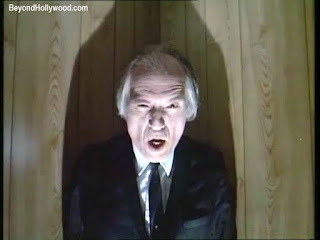 January 25, 2013. http://herocomplex.latimes.com/movies/angus-scrimm-phantasms-tall-man-still-a-striking-presence/#/0.